Now available from Amazon, Barnes and Noble and other major bookstores. A massive earthquake struck the eastern Sichuan Province of central China near Chengdu, on Monday afternoon (local time) May 12, 2008. The quake killed more than 67,000 people. 20,000 more were missing and about 300,000 were injured. Thousands were trapped under the rubble of collapsed buildings. 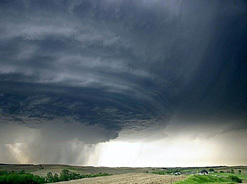 Date and Time of Origin: Monday, May 12, 2008 at 06:28:00 UTC; Monday, May 12, 2008 at 02:28:00 PM local time in Central China. Epicenter: 31.099°N, 103.279°E, in the Wenchuan County of the eastern region of the Sichuan Province, about 90 km (55 miles) WNW of Chengdu and 145 km (90 miles) WSW of Mianyang, (Sichuan Province), 360 km (220 miles) WNW of Chongqing and 1545 km (960 miles) SW of Beijing. According to the USGS at least seven major aftershocks -- measuring between 4.0 and 6.0 magnitudes – occurred in the area over the three hours after the initial earthquake of 2:28 p.m. local time (0728 GMT). Stong aftershocks can be expected to continue for many weeks or even months. Some of these aftershocks may cause additional destruction, collapse of buildings already weakened and failure of one or more of the numerous dams in the region. Such failure of a dam occurred forty five days after the August 25, 1933 earthquake in the region. 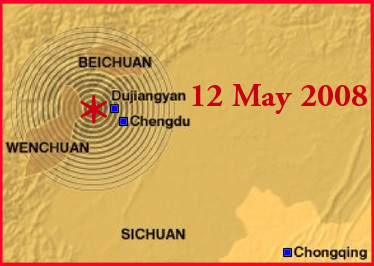 The shallow focal depth of the May 12, 2008 earthquake accounts for the strong ground motions that were felt strongly in most parts of China. The ground motions rattled buildings in Beijing, some 930 miles to the north, skyscrapers in Shanghai, and swayed buildings in Hong Kong and Taipei, 100 miles to the southeast. Also, strong ground motions were felt as far away as Pakistan, Vietnam and Thailand. According to eyewitnesses the motions lasted for about a minute. The earthquake struck the hilly country leading up to the Tibetan highlands, toppling buildings in small cities and towns in the largely rural area. However, China's Seismological Bureau stated that the earthquake had affected more than half the country's provinces and municipalities. Worse hit was Beichuan County (with population of about 112,000), the area closest to the earthquake's epicenter, about 60 miles northwest of Chengdu, the capital of Sichuan Province. Eighty percent of the buildings collapsed, killing thousands of people. The quake struck in the middle of the afternoon and that contributed to the high death toll. A three-story high school building at the Juyuan Township of Dujiangyan City, in Wenchuan County, collapsed and killed or trapped as many as 900 students. Also students were buried under the rubble of five other schools that collapsed in Deyang city. The quake affected telephone and power networks and damaged the roads linking Wenchuan County to the provincial capital, Chengdu. 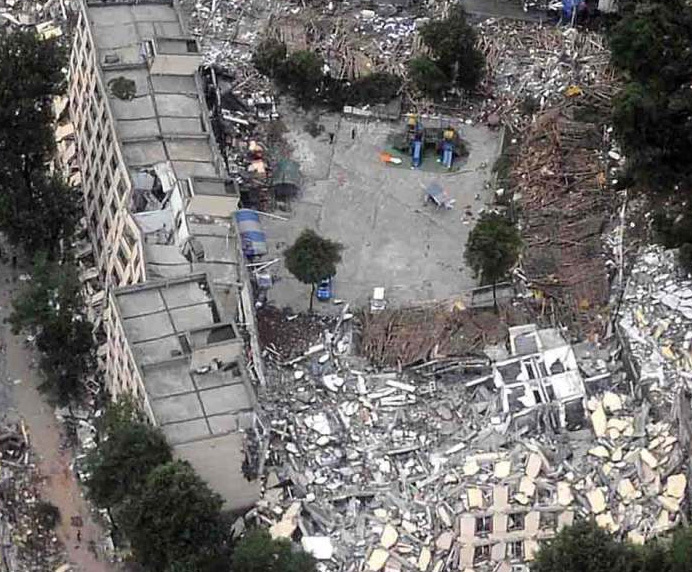 The quake caused deaths in Sichuan, in the northwest Gansu Province, in Chongqing and in Yunnan. In Sichuan's Shifang city, the quake buried hundreds of people in two collapsed chemical plants, and more than 80 tons of ammonia leaked out. According to official reports as of May 25th , the death toll reached 62,664, with another 23,775 still missing. The final death toll will not known with any certainty because of the inaccessibility of certain regions, but it is expected to rise to more than 75,000 people. The earthquake destroyed at least 500,000 properties and left about than 5 million people homeless. Thousands of schools were leveled and more than 5,000 students killed. 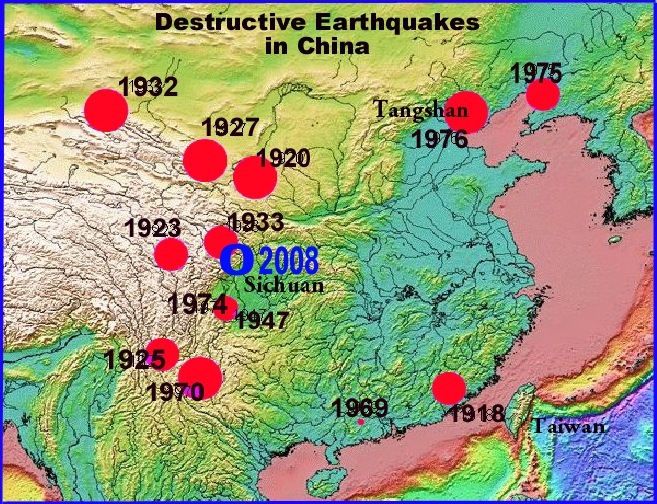 During the 20th Century there have been nine (9) great earthquakes with magnitude greater than 8.0 in China, sixty six (66) with magnitude ranging from 7 to 7.9, and three hundred and eighty-five (385) with magnitudes ranging from 6 to 6.9. Almost all of these earthquakes occurred along well-known faults. The most destructive earthquake (magnitude 7.5) in recent times was the one that struck the northeastern city of Tangshan on July 28, 1976. 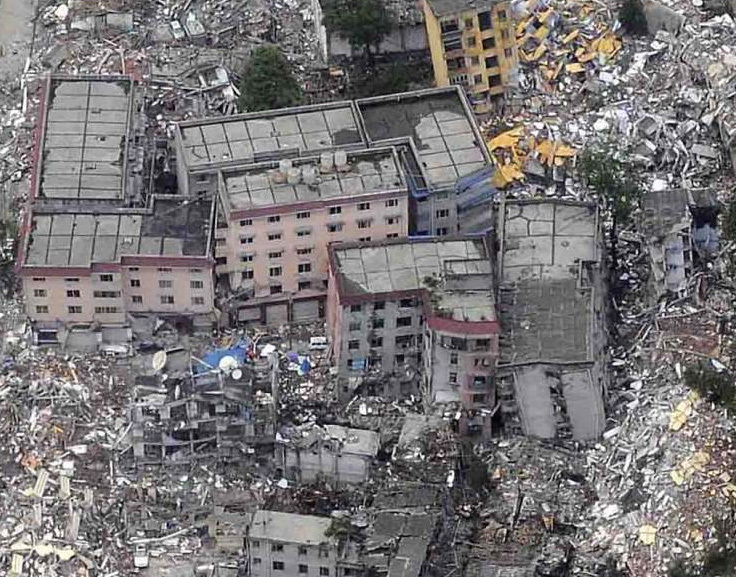 Tangshan is roughly 1,600 km from Chengdu, the nearest major city to the epicenter of the May 12, 2008 quake. The 1976 event, was the deadliest earthquake in the last four centuries. The official death toll was 255,000 people, however estimates of as high as 655,000 have been given. More recently in 2003, a 6.8-magnitude earthquake killed 268 people in Bachu County in the west of Xinjiang. 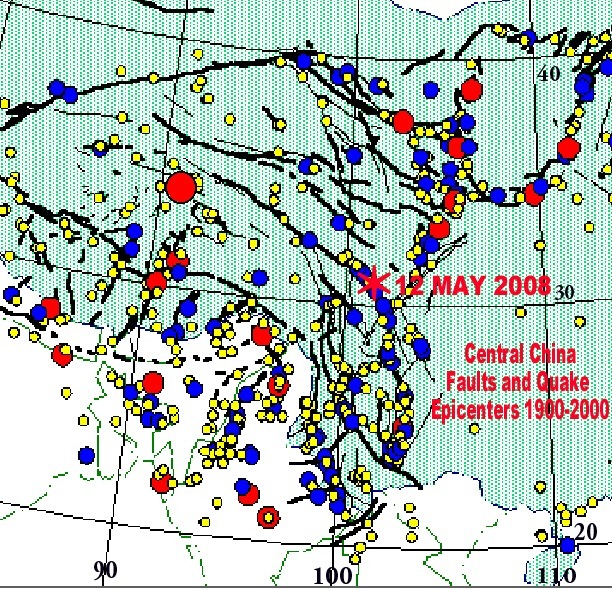 Many of the destructive earthquakes have occurred in China’s Central Region and some, ranging in magnitude from 7 to 7.9, along the same seismic belt where the May 12, 2008 earthquake struck. Since 1500 A.D. there have been at least 8 destructive earthquakes with magnitudes M7.8 or more along in this belt. On August 25, 1933, a magnitude 7.5 earthquake in Diexi, Sichuan, (about 60km away from the May 12, 2008 quake), killed more than 9,300 people and caused widespread landslides that disrupted river flows. Forty five days later, a regional dam broke resulting in more than 10,000 fatalities in the same general area. Another earthquake (Ms=7.6) in 1973 occurred on the Luohuo fault (Zhou et al., 1983). An earthquake in 1975 (Ms=6.2) occurred along the Kangding fault. 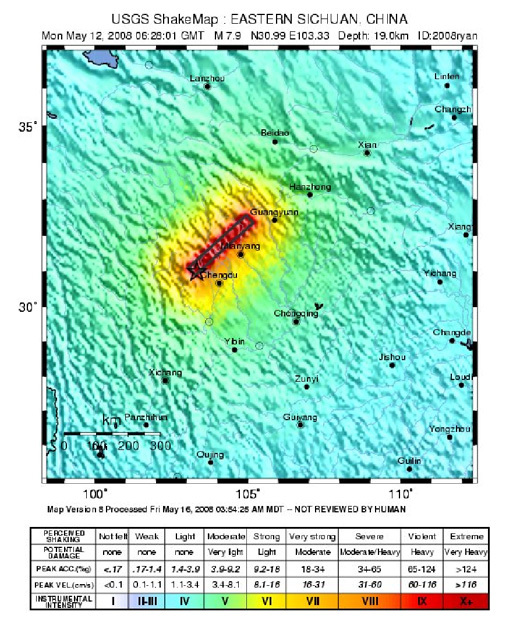 The May 12, 2008 earthquake in relation to the 1976 Songpan earthquake (modified graphic of World Data Center for Seismology). 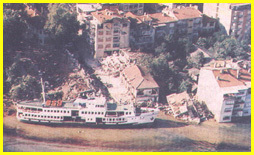 In 1976 the Songpan earthquake, with a magnitude of 7.2, occurred about 100km from the May 12, 2008 earthquake, and killed more than 800 people. A quake in 1981 (Ms=6.9) struck along the Daofu fault. Finally, an earthquake in 1982 (Ms=6.0) occurred along the Ganzi fault (Qiu-wen et al, 2003). 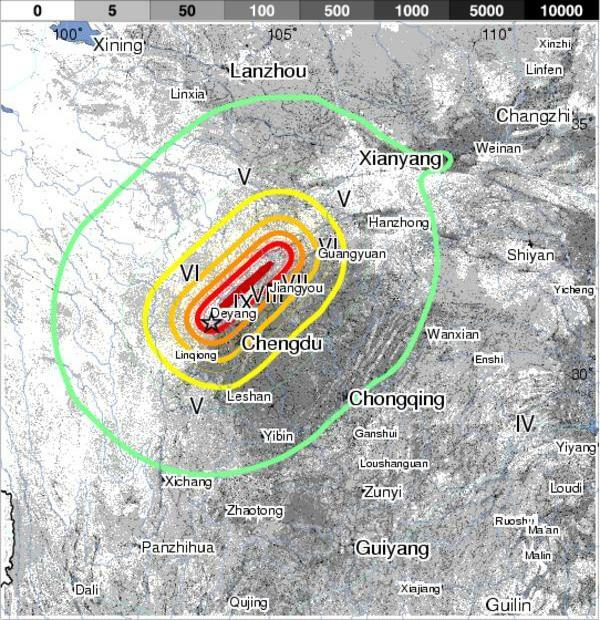 Thus, earthquakes with magnitude greater than 6.0 occur frequently and in a continuous sequence, mainly along the Xianshuihe fault belt in the Sichuan Province and along a longer seismic belt that tranverses the Sichuan and Yunnan provinces in the south. 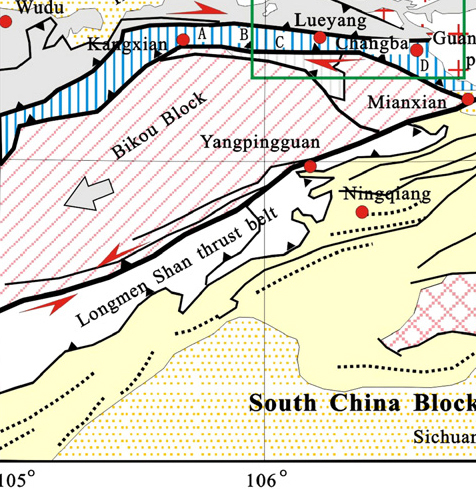 The seismotectonics of China's crustal blocks are extremely complicated. The following is only a very brief overview. The high seismicity of central and eastern Asia results from the northward collisional convergence (at about 50 mm/y) of the India tectonic plate against the Eurasian plate. This active collision - which begun about 55 million years ago - is the cause of frequent large earthquakes between India and Tibet and throughout Tibet and the surrounding areas. The convergence has uplifted the Asian highlands and the Tibetan Plateau to an average elevation of over 16,000 feet - the highest and largest plateau on Earth - with hundreds of kilometers of displacement of crustal blocks to the east and southeast in the direction of China. As India kept on moving northward and intruding into Asia by as much as 1,200 kms, the regions north of the Himalayas moved laterally to the east and southeast along large strike slip faults such as the Altyn Tagh, pushing into central China and furthermore resulting in the extrusion and movement of the crustal blocks that formed Indochina. 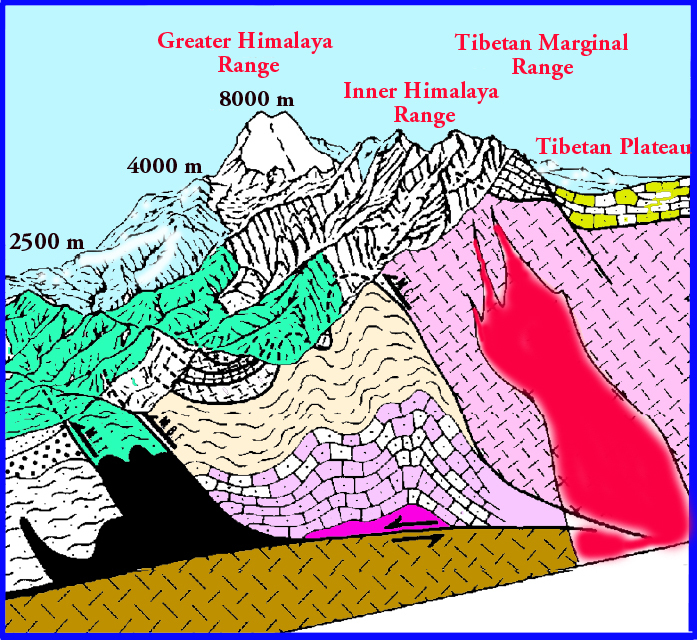 Collision of the India and Asia tectonic plates resulting in uplift of the Himalayas and of the Tibetan Plateau and its convergent extension into China (modified graphic Univ. of Berne, Inst. of Mineralogy). Three distinct deformational episodes that occurred 200- 240 million years ago resulted in initial thrusting and subsequent vertical extrusion, while later episodes resulted in folding (Li et al. 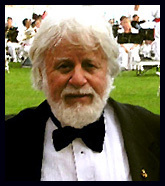 2007). This convergence has formed the most active and extensive seismic belt in China - a zone which extends from the Gansu and Nixian provinces in the north to the Sichuan and Yuan provinces in the south. Detachment of the upper crust in the Sichuan Basin of central China which has resulted in the formation of anticlinal folds, ridges, linear mountains and hills, widely separated by interfold segments (poorly-formed synclines) , and major fault zones (Landsat-1 image). The geomorphological features of the region also control the flow of major rivers and the formation of sedimentary accretion zones where - often - cities are located (a factor which also contributes to the destructiveness of earthquakes in this region by enhancement of ground motions and liquefaction). 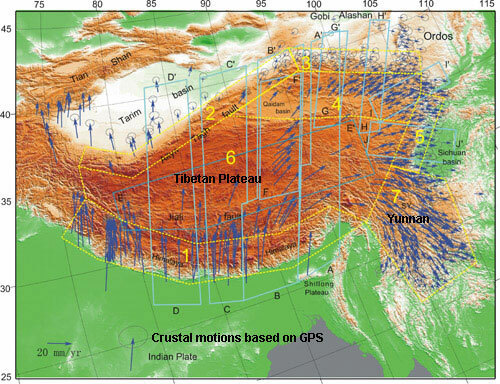 Present day seismicity of the Sichuan Province is caused by the slower-moving lateral crustal displacements which converge from the margins of the high Tibetan Plateau towards the Sichuan Basin and southeastern China. This deformation from the plateau results in additional extrusion of crustal materials which are pushed under the weaker sedimentary layers of the Sichuan Basin and of the entire southeastern region of China. 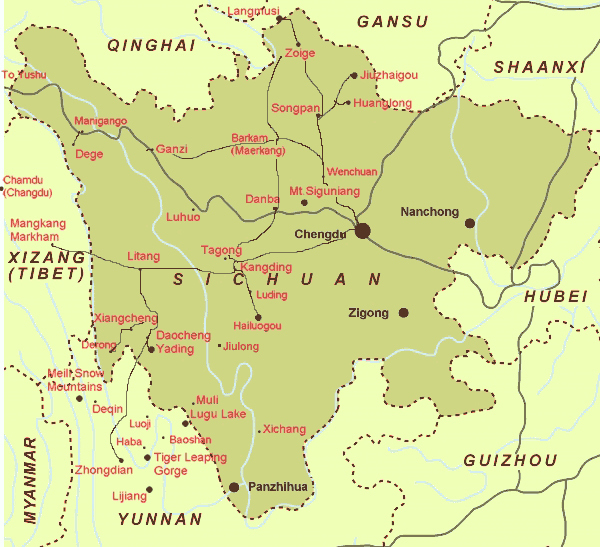 The Provinces of Yunnan and Sichuan are seismically active regions. Many earthquakes occrur along the Xianshuihe fault zone (Papadimitriou et al., 2004), which have caused a great number of casualties and significant damage to property. Since the beginning of documented history in the region 1500 years ago, there have been 32 earthquakes with Ms > 7 (Gu, 1983; Ma, 1989). Two events among them had magnitudes Ms > 8. Earthquakes in this region are characterized by shallow strike-slip faulting and focal depths ranging from 10 and 15 km. (Allen et al., 1989; Zhou et al., 1983). The Xianshuihe fault - The Xianshuihe faulthis fault extends for about 450 km. It is a long left-lateral strike-slip fault zone with an estimated Holocene slip rate of about13 mm/yr (Zhang et al. ; Papadimitriou et al., 2004. Nine earthquakes with Ms > 7 reportedly have occurred along this fault zone. The 1973 Luhuo earthquake (Ms = 7.9) was associated with 90 km of surface rupture and a maximum left-lateral displacement of 6 meters (Tang et al., 1984). To the south, the Xianshuihe fault curves into the north-south trending Xiaojiang fault. This segment is also reported to be a source of major earthquakes - such as the 1833 Songming earthquake (Ms = 8). The Longmeng Shan fault - Tectonic stresses from the strong convergences have resulted in the formation of other major faults in Sichuan Province - such as the Longmeng Shan where the May 12, 2008 occurred. Actually, the Longmen Shan fault system is a boundary zone on the northwestern margin of the Sichuan Basin, in the inner part of the South China craton. This fault system separates a crustal block known as " Bikou" on the west from the Hannan complex on the east. The Longmen Shan fault zone consists of the fold-thrust belt and some strike–slip faults such as the sinistral Yangpingguan transpressional fault. The present-day recorded deformations include the early ductile thrust zone, the subsequent brittle–ductile sinistral strike–slip zone, the last dextral brittle strike–slip fault caused by the Indosinian orogeny(Li et al. 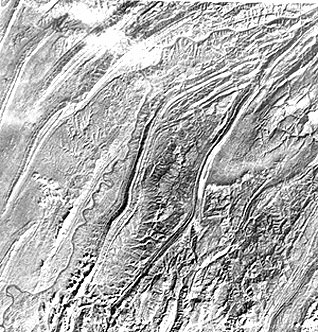 2007) - and subsequent crustal movements emanating from the Thibetan Plateau. Segment of the Longmen Shan thrust belt, to the northeast of the stricken region separating the "Bikou" block from the South China Block (the Yangtze craton (section of graphic from Li et al., 2007). 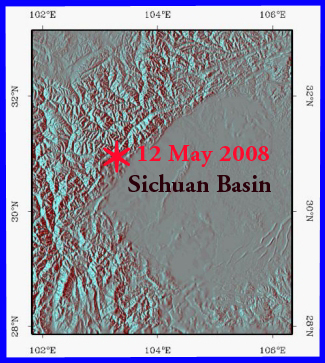 Note direction of crustal movement, overall orientation of the belt, and its approximate match with the fault plane (NST=228) of the 12 May 2008 earthquake (it changes somewhat direction west of Chengdu. Several destructive earthquakes have occurred in the past and in sequence along the Longmen Shan fault zone. As indicated previously, this fault belt includes the Luhuo, Daofu, Kangding, Qianning and Ganzi faults - all of which have produced in recent times, and in sequence, earthquakes with magnitude greater than 6.0. In fact, since 1893 there have been many more successive strong earthquakes along this zone. These earthquakes appear to migrate along the strikes of the major faults, as a result of tectonic stress transference and enhancement. Thus, additional strong earthquakes can be expected in the future along adjacent segments of this fault zone –as well as along other parallel zones. Most of the precursor events and phenomena that were recorded or observed were spread over a wide geographical area and thus were not of value in estimating where or when a large earthquake would strike. For example, there was a report that large amounts of water suddenly disappeared from a pond in Enshi city in Hubei province - but that was around 350 miles east of the epicenter of the May 12, 2008 earthquake. However, closer to the epicenter and three days before the earthquake, thousands of toads reportedly roamed the streets of Mianzhu. Mianzhu residents feared the toads were a sign of an approaching natural disaster, but a local forestry bureau official said it was normal, the Huaxi Metropolitan newspaper reported May 10, two days before the earthquake. Mianzhu was a hard-hit city where 2,000 or more people were killed. The day of the earthquake, zebras were banging their heads against a door at the zoo in Wuhan, more than 600 miles east of the epicenter, according to the Wuhan Evening Paper. Elephants swung their trunks wildly, almost hitting a staff member. The 20 lions and tigers, which normally would be asleep at midday, were walking around. Five minutes before the quake hit, dozens of peacocks started screeching. Allen, C.R., Luo Zhuoli, Qian Hong, Wen Xueze, Zhou Huwei, and Huang Weishi, (1989), Segmentation and rupture history of the Xianshuihe fault, southwestern China, U. S. Geological Survey Open-File Report 89-315, 10-31. Gu Gongxiu, (1983), Earthquake Catalog of China, Seismological Press. 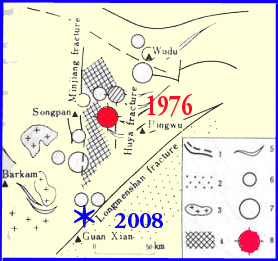 Hui- Lan Zhou, Clarence R. Allen and Hiroo Kanamori, " Rupture complexity of the 1970 Tonghai and 1973 Luhuo earthquakes, China, from P-wave inversion, and relationship to surface faulting". Bulletin of the Seismological Society of America; December 1983; v. 73; no. 6A; p. 1585-1597. Ma Xingyuan, (1989), Lithospheric dynamics atlas of China, China Cartographic Publishing House, Beijing. Zhang Qiu-wen, Zhang Pei-zhen , Wang Cheng , Wang Yi-peng and Michael A Ellis, "Earthquake triggering and delaying caused by fault interaction on Xianshuihe fault belt, southwestern China". 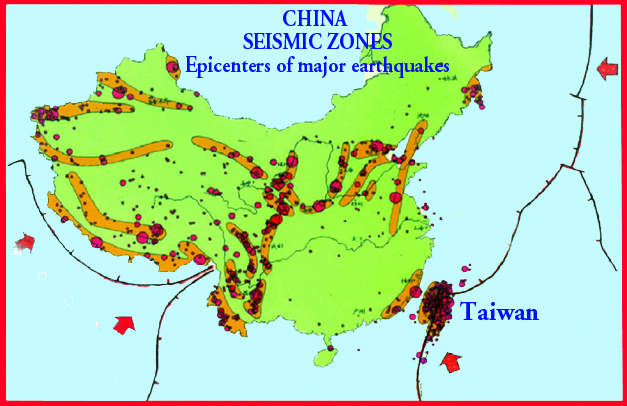 Seismological Society of China, Volume 16, Number 2 / March, 2003. Zhou Huilan, Liu H.-L., and H. Kanamori, (1983), Source processes of large earthquakes along the Xianshuihe fault in southwestern China, Bull. Seism. Soc. Am., 73, 171-181. Peizhen Zhang, Zhi-xian Yang, H. K. Gupta, S.C. Bhatia, Kaye M. Shedlock, Global Seismic Hazard Assessment Program (GSHAP) in Continental Asia.